Who coined this phrase? I have no idea. But I am the mother of three boys, with my oldest about to leave for college in a month. My youngest is six. And I swear only about 10 minutes passed from the time my college-bound guy was heading to kindergarten, and now. We all know that time flies, and when someone says that to you, it’s usually a sign that there has been an uncomfortable lull in the conversation or the person is deeply, deeply dull and should probably be avoided. However, when I first heard the expression, “the days are long but the years are short” to describe this journey of parenting, I thought: now that captures everything. We spend so much of our lives as mothers just hoping for the next stage (no more teething! no more poopy diapers! no more having to use that suction thing to get mucous out of the nose of a child who can now use a tissue himself! hooray!). The days are so long, particularly when you are sleep-deprived, which is most of the time. And yet…. You wake up one day and you are packing that teething, poopy, snotty kid for college. And you feel as if no time has passed at all. It is beautiful, it is magic, it is heartbreaking, and it is life. If you make a smoothie every morning for your children (and, uh, actually watch them drink it), you will know that they had at least one healthy thing that day. If he had his druthers, he would have what is known in our household as “vacation cereal” (you get the picture) for breakfast, chicken nuggets with french fries for lunch, and a cheeseburger with more fries for dinner. It never fails that, when given food choices, he always lunges for the least healthy thing. So I exercise what little parental control I can by making a smoothie just about every morning. Sometimes the smoothie contains kefir and frozen fruit, sometimes it contains apples, grapes, kale and avocado. Miraculously, he will drink all smoothies, except the ones that contain the hemp protein powder I bought at Trader Joe’s that makes any smoothie taste like it has sand in it. But he will drink in liquid form foods that he would never eat if he saw them on a plate. So he leaves for school a little bit healthier, and I leave for work feeling like I’ve done at least one good thing as a mother that day. 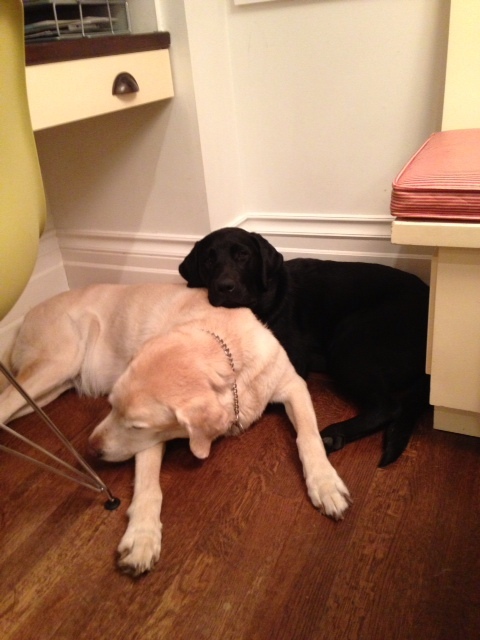 In addition to three boys and a husband, I live with two big, shedding labrador retrievers. (This is when most people say “Oh my God.”) At certain times of year, there are literally tumbleweeds of dog hair rolling around in my kitchen. I can’t explain how or why, but the FURminator is the only dog brush I have ever found that actually works well enough for me to notice a reduction in the number of tumbleweeds, which impacts my daily happiness much more than it probably should.